"A serious kink in the reductionist jazz historian's neck, Gilmore was at once a dedicated aural explorer and a bona-fide hard-bop giant." While he is best known for his work with Sun Ra amid the emergence of free-jazz and creative music, John Gilmore had an important impact on much of the post-modal mainstream, in no small part through his influence on John Coltrane. A serious kink in the reductionist jazz historian's neck, Gilmore was at once a dedicated aural explorer and a bona-fide hard-bop giant, taking eight months off Arkestra duties in the mid-'60s--at the height of Ra's most outre space investigations--to tour with Art Blakey's Jazz Messengers. As influences, he cited Hawk, Bird and Pres, but also Stan Getz; he possessed a beautiful tone, played stunning ballads, but was also one of the most thorough investigators of saxophonic extremes, from slap-toungue to overblowing and harmonics. Neither all out nor all in, Gilmore exemplified the maintenance of tradition at the core of innovation. Born in Summit, Miss. on Sept. 28, 1931, Gilmore studied clarinet as a teenager after moving to Chicago at age three. He had a stint from '48-'51 as a clarinet soloist in Air Force bands. Like so many great Chicago musicians, he studied under Captain Walter Dyett at Du Sable Hight School. On tenor, he toured in 1952 with the Earl Hines Orchestra as part of a road show accompanying the Harlem Globetrotters. In 1953, Gilmore became one of the intial members of Sun Ra's quickly expanding Arkestra, alongside fellow-saxophonists Pat Patrick and Marshall Allen. Gilmore was a key element of early Arkestral maneuvers, playing on their first record, Jazz By Sun Ra, released in 1957 on Transition (available on the Delmark disc Sun Song), and on the initial offerings from Ra's prototypic independent label, Saturn; in the end, he had appeared on nearly all of Ra's 150-plus records. Along with tenor and clarinet, Gilmore played drum kit when needed, and his startling early use of bass clarinet can be heard on "Dimensions In Time" on Fate In A Pleasant Mood/When Sun Comes Out (Evidence). Gilmore credited the advanced intervals of Ra's composition "Saturn" with causing him to commit himself to the Arkestra. "I'm not gonna run across anybody who's moving as fast as Sun Ra," he told Graham Lock in The Wire in 1990. "So I just stay where I am." Though he was a devoted Arkestra member through-and-through, Gilmore made a number of notable records outside Ra's omniverse as well. While still in the Windy City, he and Clifford Jordan co-led a classic date for Blue Note, Blowing In From Chicago, with a monster rhythm section of Blakey, Horace Silver and Curly Russell. When the Arkestra relocated to new York in the early '60s, there was little work for the huge vanguard ensemble, so the members took more side-gigs than usual; at this time, Gilmore played on Impulse! Records with McCoy Tyner and Freddie Hubbard, and elsewhere with Elmo Hope, Paul Bley, Pete La Roca, Andrew Hill and Blakey. 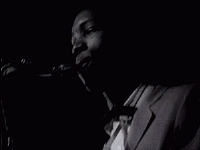 During one of Gilmore's first New York performances at Birdland, Coltrane ran up to the stage after his solo yelling, "He's got it! Gilmore's got the concept!" By his own admission, Coltrane--who asked for a quickie lesson after the set--was so moved by Gilmore's harmonically ingenious, against-the-grain style that it inspired him to create the groundbreaking "Chasin' The Train." On the day Gilmore died, the Arkestra was playing at Kimball's East in the San Francisco Bay Area, and in tribute they featured some of the tunes he loved best. Many of us will think fondly back on the great tenor player crooning "East Of The Sun (And West Of The Moon)." Gilmore was one of the great omni-musicians in jazz, a warm, quite person, and a gentle iconoclast. A selected discography of John Gilmore albums. Blowing In From Chicago, 1957, Blue Note. Today And Tomorrow [McCoy Tyner], 1963, Impulse! Bliss! [Pete LaRoca/Chick Corea] ,1967, Muse. Dizzy Reece/John Gilmore, 1970, Futura.